The new Stampin' Up! 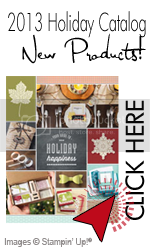 Occasions Mini Catalog is packed with new, very cool, tools, stamps, and accessories. The Hostess stamp set "Up in the Air" on page 5 is one of my favorites and I couldn't wait to make something with it. This card was inspired by a creation I came upon by Nancy Littrell. I loved her idea of hanging hearts from tree branches and as soon as I saw this stamp, I knew just what to do with it. I don't trust my drawing a straight line so I used Stampin' Up! 's Piercing Mat Pack. I love the additional texture along with the embossed hearts from the new "Fashionable Hearts" Embosslits Die on page 35 of the Occasions Mini. The sentiment is from the set "P.S. I Love You" on page 8. All these supplies can be viewed and purchased at my online store by clicking HERE. This card is one of many we will be making on February 4th Valentine Card class. the class is almost full already so if you would like to come, please contact me right away. Happy stamping! Tags: Making Valentines, Occasions Mini Catalog, Rubber Stamping Class, SAB, Sale a Bration, Stampin' Up!